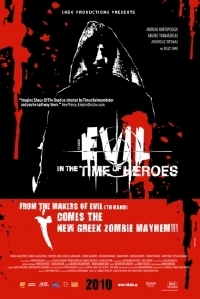 Set just minutes after the ending of the first installment, â€˜To Kako: Evilâ€™; To Kako - Evil in the Time of Heroes is a Greek zombie movie directed by Yorgos Noussias, and itâ€™s completely insane. It begins with a group of warriors in ancient Greece, sitting around a camp fire telling jokes (specifically Mrs. Wallaceâ€™s â€˜Ketchupâ€™ joke from Pulp Fiction â€“ first of about a dozen Tarantino references) before being attacked by bloody zombies. Spin forward two thousand years and weâ€™re in modern Athens and the same thing is going on. Our heroes from the first film are still fleeing the zombie hordes and seeking shelter at the cookâ€™s house, along with a rag tag bunch of survivors including someone we had been led to believe had died in the first film. While far from perfect, Evil in the Time of Heroes scores big simply by being so damn crazy. The story involves a soldier named Vakirtzis, a taxi driver, Argyris, a punk rocker called Johnny and a host of secondary characters with various back stories. Thereâ€™s also the slightly alarming inclusion of Billy Zane as a brooding narrator who follows Argyrisâ€™ progress, aware that he is a key part of the zombie uprising. To explain the plot beyond the above is kind of pointless, Iâ€™ve got pages of notes but all they do is highlight a few of the stranger segments, such as when Vakirtzis meets his arch nemesis, a man who stole his parking space before the zombie invasion, years ago. Throughout the film they meet again and again, with parking-space-man belittling him until they have a major fight scene on top of a tower block. In the flashback we see Vakirtzis in his car driving his mother, who is played by the same actor but wearing lipstick and a shawl. Okay, hereâ€™s some plot: At the beginning of the film the group are still in flight-mode, frantically driving a stolen car and dodging sniper bullets from other survivors (here we learn that itâ€™s possible to outrun a gunshot with some slow-mo effects), until they reach the apartment of â€˜the cookâ€™, my favourite character (heâ€™s so nimble that in one fluid movement he can slip on plastic shoe protectors before stomping a zombieâ€™s head) and they get the chance to relax and explain where theyâ€™re coming form. After visiting an internet cafÃ© they learn that the army will bomb Athens to the ground in a few hours to contain the infection, so plan to flee the city but become involved with all kinds of distracting events. The film culminates with a huge confrontation between zombies and survivors in the centre of the city, with Argyris and Billy Zane (whose presence isnâ€™t too distracting, but stillâ€¦ Billy Zane?) trying to save the day while a countdown siren sounds. The third act comes from left field and is incredibly ambitious, but the low budget begins to show at times and really the whole thing is so ridiculous that it relies heavily on audience support. Seeing this at a horror festival over Halloween is pretty much the best way to view Evil in Time of Heroes, and the crowd I was with loved it. The festival director himself joked that although he really liked the movie, he didnâ€™t have a clue what the hell it was all about. Itâ€™s not so much a movie as it is a live action computer game, complete with all kinds of freaky effects, blood splats and the camera occasionally zooming into bodies to show CGI blood cells becoming infected, as characters are thrown (literally) off the face of the Earth and flail around in outer space (nice nod to Forbidden Zone). Sometimes if a character dies they fade away like in a consol game, and yet the gore is in abundance. To say the film is often so random that itâ€™s baffling is a major understatement. Iâ€™m pretty confident in recommending this though, despite the low scoring on some movie sites it is the real deal; a bizarre, confident mess of a movie with some brilliant Jeunet-esque sight gags and characters stumbling through outrageous situations with a smile on their face and another smart quip at the ready when needed. While the direction is mildly psychotic, the sound, editing and visual effects are all top notch. A highly entertaining, but very silly zombie romp.